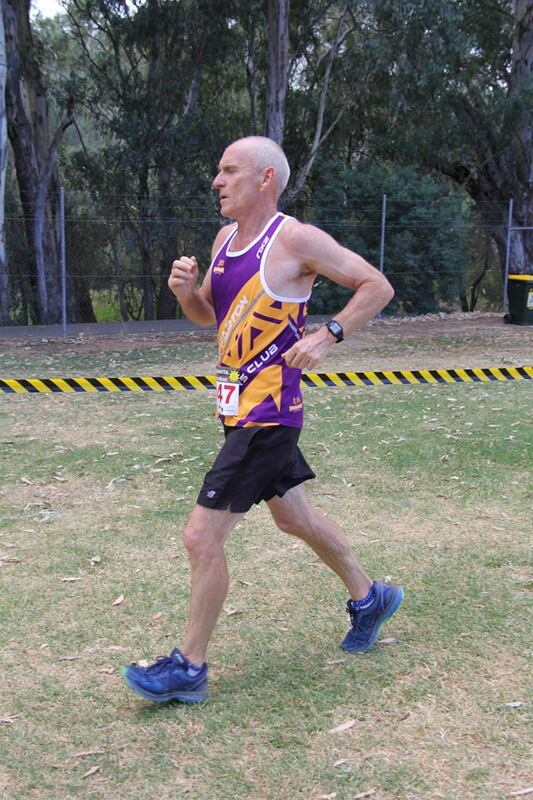 Trevor Dainton getting ready for Marathon No1 at Wangaratta 2018. It was like a Sunday long run, but with an added bonus of a pacer ( how lucky am I!) Steady pace until 15-16km when I was going to accelerate… but boom consistent toe & leg cramps (inappropriate words may have passed my lips) No way was I going to stop! Chris Nicholson paced me home and even gave me his last gel as mine had dropped out. Happy dance of a 5min PB. We had a group that tagged onto Chris pacing – which was really cool. I’m going to admit it straight up. 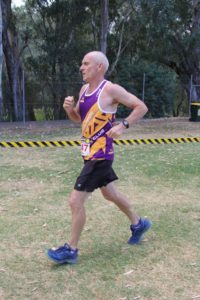 I went into Wangaratta Half Marathon with not enough long runs. Seems to be a reoccurring issue with any event in the first 2 months of the year. I went out too fast too early, I was caught in that running hype with other runners at the start line. Whoops. The groin and hips paid the price once I hit 16km. Enough of the negative… let’s get to the positive! It was super supportive with everyone from SRC supporting one another. 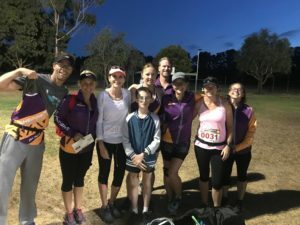 Seeing Kath, Narelle, Chris N, Kate, Steve, Grant and Louise with positive words on each pass (Kate not so much towards the end) was motivational. Kate and Chris caught up to me and helped me along for 2kms towards the end which helped me significantly mentally. 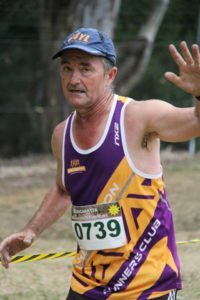 I am training for the Murray River Marathon in Albury on March 25th. The Wang half was just a test run to see where I was up to. Chris Armstrong has been following my training on Strava and reading my weekly comments on a FB page. 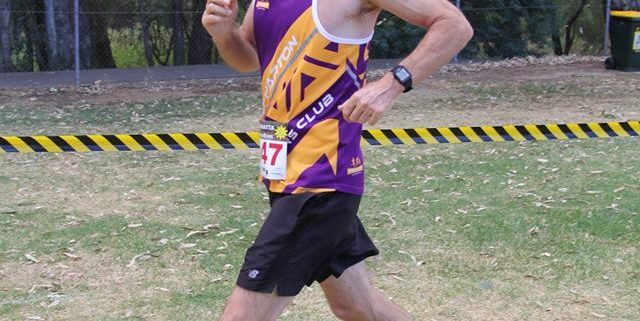 On the Saturday before the Wangaratta half marathon Chris said to me, good luck and be kind to yourself. I think he knew if my time shot out to one I was not happy with due to my knee niggle I would be disappointed and hard on myself. Sunday came and as per normal I left Shepparton with no time to spare if I needed it. I got to the start line just in time to see Trevor, Kathy, and Narelle off in the Marathon. I then had 15 minutes to get my race number and go to the loo before the half started. 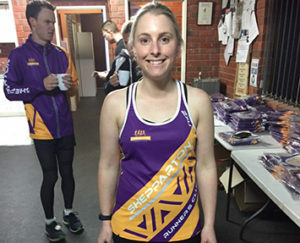 Dotted throughout the half marathoners I spotted the Shepparton Runners as we all had our SRC purple tops on. As the race started I tried to settle into a 6:30 min/km pace. After about 3 km I knew I wasn’t going to maintain this so I slowly let it slide to 6:40 min/km. After 5 km I locked my pace into that of the blind runner and his guide runner. We changed positions about 10 times never getting more than 50 mtrs in front of the other. We spoke to each other as we passed. How the hell did he know it was me passing him. With 3 km to go with the average now at 6:50 min/km I picked up the pace. I crossed the line with a time of 2:24:00 and an average pace of 6:48 min/km, 15 minutes slower than last year. I was happy with the result. I ran all the way, with only one scheduled walk break at 11 km. And I got to chat to the blind runner when he crossed the finish line. A couple of things that I was pleased with on the day after I crossed the line. Every SRC member was in their purple top. Not that that was compulsory, but it was good to see. Also after I crossed the line, everyone waited for what turned out to be an hour to see our marathoners run across the line. The coffee and donuts supplied by Kate kept us nourished just in case we had to wait a long time. Well done to Trevor, Kathy, and Narelle. I think Kate still has a tear in her eye. Well done to everyone who competed at Wangaratta and in particular all those who did a PB. As a member and competitor the support from SRC people during and after the events was fantastic. During the event our members stood out in our new colours and it made it easier to give support to fellow runners as we passed each other. Congratulations should also go to Justin and Sharon for what was a well organised and successful event. 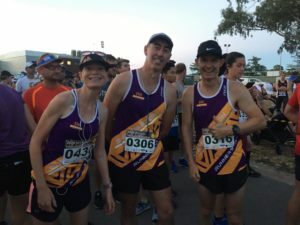 Personally I learned a lot from the event and in particular how not to run a marathon and I look forward to smashing my time at my next marathon at either Gold Coast or Shepparton. 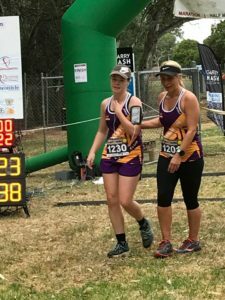 It also emphasised to me just how impressive Kathy Fuller and Narelle Pell have been in turning out marathon after marathon. My knees were screaming at me for the last 10kms and have asked for and will be rewarded with a well earned rest this week. 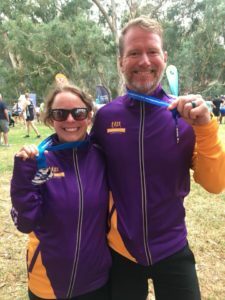 On Sunday, Sam and I took on the 10km run at Wangaratta. 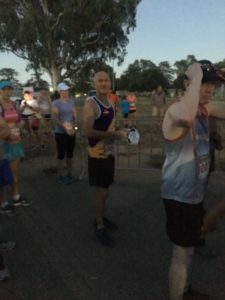 After an unpleasantly early start from Shepparton, we got to Wang in time for multiple loo trips and to see the start of the full and half marathons. As we lined up for the 10km start I was busy chatting to Natalie and Mel and completely missed the starter gun so was swept up with the crowd! 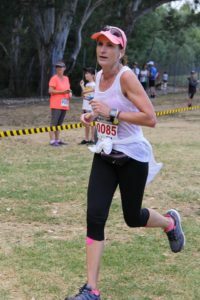 I have a habit of going too hard too fast and being overexcited then dying at around the 2km mark, so I really forced myself to slow down and go at my own pace, which was super hard, but I was rewarded with feeling pretty comfortable the whole way and getting myself a PB, not quite the sub 60 minutes I was dreaming of but it was pretty close! Sam took it easy and enjoyed the run, cruising to a comfortable finish time of 53 minutes…which is what he planned! 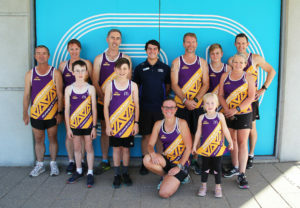 It was a great day with heaps of SRC purple singlets making a big presence, it was awesome to be able to spot the shirts in advance and cheer people on! 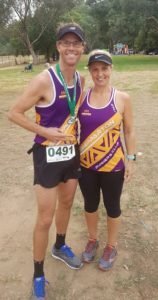 Wangaratta Marathon and Fun runs community teams result. Please see the you tube link below. Despite SRC punching about our weight again we didn’t win under the rules and we didn’t get the second draw prize. 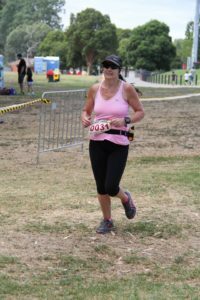 I wanted to do a fun run so signed up for the 10km at Numurkah Fun Run. A volunteer and his young son rode their push bikes next to me and picked up the witches hats. The son asked his dad if I was the last runner? “Yes mate, he replied.” Chris met me with 1km to go ready with encouragement. I gave him nothing and kept going. I came dead last. I came away from that very determined to get better. Initially it was self confidence. I didn’t want to run with anyone. Going to parkrun changed that. Everyone is so supportive. Thank you Allan & Kerry Connolly. Running more than once a week, listening to Chris, executing the plan and pacing. Chris because he is so patient and even when I tell him I can’t he’ll try to help. Is there anything else you’d like to share like a funny moment, or something inspirational? I want to thank the SRC. Since coming on board 12 months ago and seeing the progress everyone has made has been great. It’s been hard work but rewarding to see the progress, PB’s, photos and smiles. Shepaprton Runners Club are excited to be partnered with Sportsmans Warehouse (SW) for 2018. SW are offering 10% off Full Priced Footwear and Clothing for all members who are SW Chase the Feeling (CTF) Rewards Members (plus earn points on every transaction). We are currently in the process of building the database for Sportsmans Warehouse. Can you please let Mathieu Ryan know if you are a member or not so everyone can start receiving your discount. The team at Fix MP have extended their Yoga offer for another 3 weeks. For the next 3 weeks, Shepparton Runners Club members have access to Yoga sessions on Tuesday morning at 6:15am for FREE! All you have to do is call the team at Fix MP on 5831 5400 and reserve your spot. Nothing beats pacer week and great to see all positions filled. We look forward to seeing everyone again thus Saturday for event 212. Back by popular demand, the 1600m handicap is locked in for March. 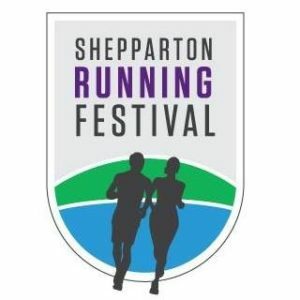 The Shepparton event is in its sixth year & offers participants a 4km walk & a 4km & 8km run! We have events suitable for all ages and abilities. Our certified accurate course is known for being flat and fast, ideal for those looking for a PB, stepping up a distance or a beginner runner. The stunning Victoria Park Lake is the centrepiece of the Shepparton Running Festival. Launching within the next few days. Remember to like and Share all SRF Facebook posts.